Hard anodised Billet Alloy AL7075 Racing Wheel Nuts! AIRCRAFT GRADE AL7075 ALUMINIUM MATERIAL!
. ULTRA LIGHTWEIGHT TO REDUCE UNSPRUNG WEIGHT BY UP TO 10 TIMES COMPARED TO STOCK STEEL NUTS!!!
. THESE WHEELS NUTS ARE MADE OF ULTRA-HIGH GRADE MATERIAL AL7075 AND CNC MACHINED TO HIGH ACCURACY, Please, NOT TO BE MISTAKEN OR COMPARED TO CHEAPLY AVAILABLE ALUMINIUM NUTS made of lower grade aluminium with colour fades at the very first use!
. NEW STOCKS available in 40mm length body with OPEN or CLOSED ends(limited stocks), and choice of HARD ANODISED FINISH in BRONZE or MATT BLACK. $188 for 20 pieces with FREE REGISTERED DELIVERY! Hi Ivan, do you still have the open end nuts in stock? YES, I will PM you when I return from overseas on the 11th Jan.
Any chance these will be in red? SORRY, only in BLACK or the BRONZE colour, only HARD ANODISED for extra strength. Other colours are just basic anodised colours with NO strength added and fade very easily. These are still in stock. Do you have lock nuts to go with these? Are these 17mm or 19mm hex? Do you know how much each nut weighs? These are 19mm HEX, extra long wheel nuts. EACH weighs about 27 grams. 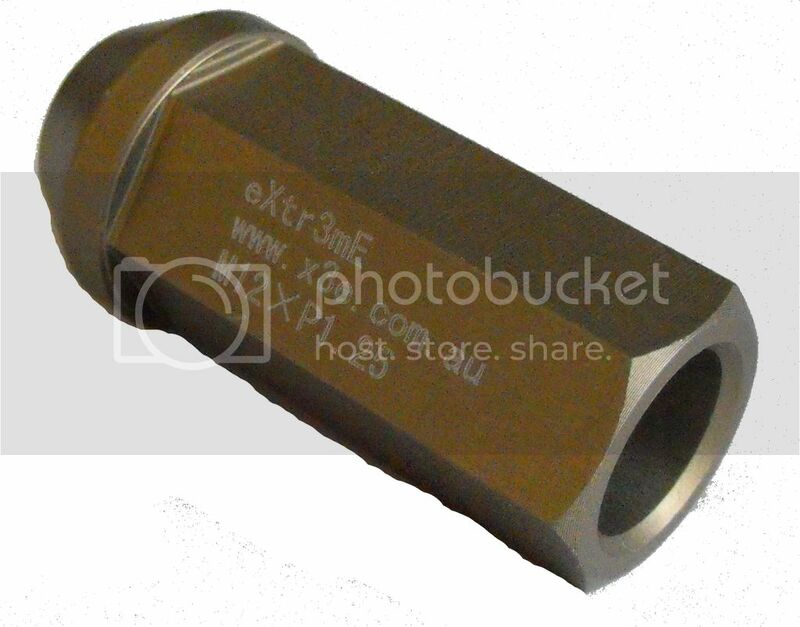 I might have some of the SHORT type, 19mm Hex and weighs only 20 grams. These are for TAPERED type. STOCK IS FLAT WASHER type. YES, LONG TYPE in stock. a. In either BLACK or BRONZE, in hard anodised finish. b. OPEN or CLOSED ends. Thanks for that just one last question on your website you also have the steel wheel nuts with the washers how are they compared to the ones above? Some do have bad experience with alloy wheel nuts that are NOT AL7075 grade or have a habit of over-torquing their wheel nuts, then the STEEL with floating alloy washer is the next step of assurance, plus allows more room to error. Also they have shy away from alloy wheel nuts and would prefer a steel made type. (NOT everyone has a torque wrench at hand...but a very important investment in the tool box!) Being made to 17mm hex, are lightweight too. My experience with my 40mm Closed end wheel nuts. Car has done over 40,000km's on these wheel nuts. On the road I run a pretty heavy Rota Grid set up (18 x 9.5) and on the track I use Enkei RPF1. I have always used these wheel nuts and they have been hammered on and off the wheels twice every track day (12 track days +) with a variety of impact drivers. Rattle guns at workshops have attacked these nuts every time I've stripped and fitted tyres, changed pads or various servicing at workshops. They are absolutely bullet proof, no indents in the edges and they have kept a perfectly hard and smooth surface on all sides. If I was to buy a set again, I would go the bronze. The black will tend to fade over time due to the heat from the track sessions, they never faded on the street. I'd happily recommend them to anyone and there isn't any other wheel nuts I know of for the price that are as robust and lightweight as these. Your feedback is important so that other members will have an informed information other than our sale data. X3E is proud of our engineered parts with specifications from the raw material used, the quality of the manufacturing to the final quality of Hard Anodised treatment, no short cuts. Marek yes he does. I just bought these last week. Yes, only Bronze in stock, Open Ends. $168 for 20 pieces with FREE REGISTERED DELIVERY! Still have these in stock Ivan?